You snooze, you lose. That’s more than just a trite turn of phrase. 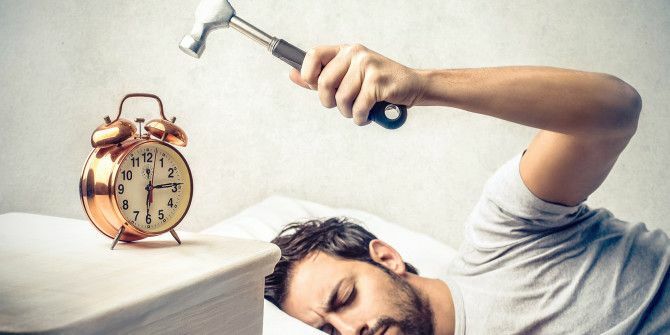 Hitting the Snooze button on your alarm clock has a negative effect on your health. It cuts your sleep cycle short, multiple times, and keeps you groggy for quite some time after you’re out of bed. There is a way to counter this effect, which scientists call sleep inertia. Set your alarm clock for later — to give your body the rest it clearly needs — and get up when it rings the first time. Now, resisting the temptation to hit Snooze is the difficult part. That’s where a well-planned morning routine can help. It makes you alert, draws your attention elsewhere, and keeps you from going back to sleep. Add tech to the picture and you can really turn your morning around, going from grumpy to happy in a few days’ time. Jumping out of bed eager to start the day is not how many of us are every morning. Fumbling around for the alarm clock and burrowing deeper under the covers is more like it. If you wish you could start your day energetically, you need to arrange for an effective wake-up call. Your regular alarm clock does not belong to that category. But you have quite a few other options to choose from. If you’re well-rested, you’re likely to wake up without an alarm clock to guide you. If you do need a little help waking up properly, buy an unusual alarm clock that won’t look kindly on your snoozing habits. For example, there’s one that eats your money if you don’t wake up and turn it off, and another that runs away and hides from you. For simplicity, you could always try placing the alarm way out of reach. There’s nothing like a playlist of your favorite upbeat songs to get your body moving. Use it as part of your morning routine. Create a “morning” playlist on Spotify or SoundCloud, or tune in to your favorite radio station right after you wake up. Better yet, set up your smartphone to play your kind of music automatically at a fixed time every morning. Create mood-based playlists, choosing peppy and energetic tracks for weekdays and something nice and dreamy for the weekend. Browse MakeUseOf’s Sound Sunday archives to find free music to suit every mood. Listening to what’s going on in different parts of the world forces you to look outward and acknowledge reality. Some of the news can be depressing, but you can always choose to filter your news sources beforehand to ensure that you get a personalized news feed. Such personalization is now quite easy thanks to audio-streaming apps like Umano and Newsbeat, which learn your news preferences over time and deliver relevant stories accordingly Umano: Listen To The News As Read By Real People Umano: Listen To The News As Read By Real People Read More . “I have no time” is no longer a valid excuse not to exercise when you can get your heart pumping in as few as seven minutes. Start your day with one of these 7-minute workouts Use Free 7 Minute Workout Videos To Get Into Shape [Stuff to Watch] Use Free 7 Minute Workout Videos To Get Into Shape [Stuff to Watch] There are lots of YouTube videos that can show you exactly how your workouts should be going, and they won't cost you a penny. Read More or a brisk 20-minute walk. Choose curated playlists with uplifting tracks Upbeat Easy Listening Music To Lift Your Mood For A Happy Day [Sound Sunday] Upbeat Easy Listening Music To Lift Your Mood For A Happy Day [Sound Sunday] Music can get you through any day. And with Sound Sunday, all your music downloads are free! In this edition, you'll find albums perfectly suited for animating your feet and inspiring a happy mood. Read More to accompany your exercise routine and make your fitness regimen fun. Once you get into the habit of exercising consistently, you can experiment with other forms of exercise such as aerobics, Yoga, running, swimming, cycling, hiking, etc. Look to these fitness bloggers Improve Your Health, Improve Yourself: 3 Fitness Bloggers Show You How Improve Your Health, Improve Yourself: 3 Fitness Bloggers Show You How Good health and habits are vital for a better life. But perhaps you are stuck in a rut. The good news is that you can release yourself from it with a healthy dose of inspiration. Read More for inspiration and advice. If all of these exercise options sound too much like work to you, just don your sweats, play some good music, and dance your heart out. The important thing is to work up a sweat and give your metabolism a boost. Even some form of mental exercise 5 Things You Can Do in 5 Minutes to Exercise Your Brain 5 Things You Can Do in 5 Minutes to Exercise Your Brain Keeping your brain in top shape requires that you challenge it on a regular basis. Surprisingly, you can do a lot in five minutes. Here are five things you can do for your mental fitness. Read More can be a good addition to your morning routine. Fill in a crossword. Solve a Sudoku puzzle. Keep that brain whirring. When it comes to creating good habits, it certainly is all in the mind. Get your mind in gear and your body will follow suit. But how do you make the first part happen? By getting a healthy dose of inspiration first thing in the morning, of course. Don’t you see the plants, the birds, the ants and spiders and bees going about their individual tasks, putting the world in order, as best they can? And you’re not willing to do your job as a human being? Why aren’t you running to do what your nature demands? Line up something that you know will have you moving forward with enthusiasm. Scour the Web for real-life stories of people who beat all odds to accomplish something worthwhile. Look for a few blogs that feature tough-talking people who can help you get the motivation and discipline you’re looking for. Even a single person will do. Take their advice to heart and follow up on it. Ensure that you’re exposed to their words and thoughts every single morning. Here are a few ways you can do that. Set up an IFTTT recipe to deliver inspiration to your inbox, based on specific keywords or via specific sources. If you find a song or a quote that you know gets you off the couch and raring to go, use it as a trigger to start your morning on a positive note. Turn that quote into your phone’s wallpaper or that song into your ring tone. Pick a handful of podcasts that share stories of people who have made it, and listen to an episode or two. Put Good Life Project at the top of your list. Visit a blog that has informative articles on self-improvement and read an article at random. You might find startling insights this way. Begin your search with jamesclear.com and the Buffer blog. If you have a Twitter account, set up a list of people who tweet smart stuff that you can take action on, and read their tweets as part of your morning routine. Start with Garrick van Buren. If you find it a chore to work on your morning routine by yourself, pair up with an accountability partner or an “accountabilibuddy” (thank you, South Park). Swap to-do lists Stop, Collaborate and List: 5 iPhone Apps for Shared List-Keeping Stop, Collaborate and List: 5 iPhone Apps for Shared List-Keeping The App Store is full of applications that allow you to form lists and collaborate with others. Whether you are looking for lists to keep track of things around the house, or for work related... Read More and challenge each other to get things done. Push each other to exercise every day, and see who maintains the longest streak 4 Simple Motivational Web Apps That Can Spur You Into Action in Seconds 4 Simple Motivational Web Apps That Can Spur You Into Action in Seconds How to motivate yourself isn’t taught in schools. It is something each of us must learn to do on one’s own…or take the help of the web for some pointers. One of the pointers that... Read More for workouts. Bounce ideas of each other. Exchange interesting trivia. Did you know that the little doohickey at the end of your shoelace is called an aglet? If you haven’t adopted a morning ritual 8 Daily Rituals You Can Create To Boost Your Geeky Productivity 8 Daily Rituals You Can Create To Boost Your Geeky Productivity Habits are hard to hack. Daily rituals are way easier. You keep at something (good or bad) for several days in a row and it turns into a habit. Read More yet, I’d recommend you give it a shot. After experimenting with several variations and settling on one that I’m comfortable with, I can assure you that it automatically structures your day for the better. The tips listed above are a good place to start. If you’re still working on your morning routine, here’s a little inspiration. Take your cue from how various famous people begin their day. With a little thought and creativity, you can create the perfect start to your day, your way. How does tech play a part in your morning routine? Share your secret in the comments. I've been on 2nd shift for nearly 20 years until recently (1st shift and lots of travel). 2nd is sweet, because you wake up naturally with no need for alarms, can ease into your day, exercise, run errands with less traffic, etc. 1st shift on the other hand is brutal! The only tech that helps me is the preset coffee maker and a loud cd player in my car blaring heavy metal! I hope I get my 2nd back soon! The one that was brutal for me was the 3rd shift - midnight-8 AM. Totally out of sync with the world, always felt in a fog. The shift I liked the best was 2 PM - 10 PM. My first career job out of high school as a machinist was 3rd shift, 4-10's Mon-Thurs 10pm-8am. I got off at 8am Fri and didn't go back until 10pm Mon. I would take that again in a heartbeat! I did 2-10 for a few years and loved it, but now I want my 3-11 back!